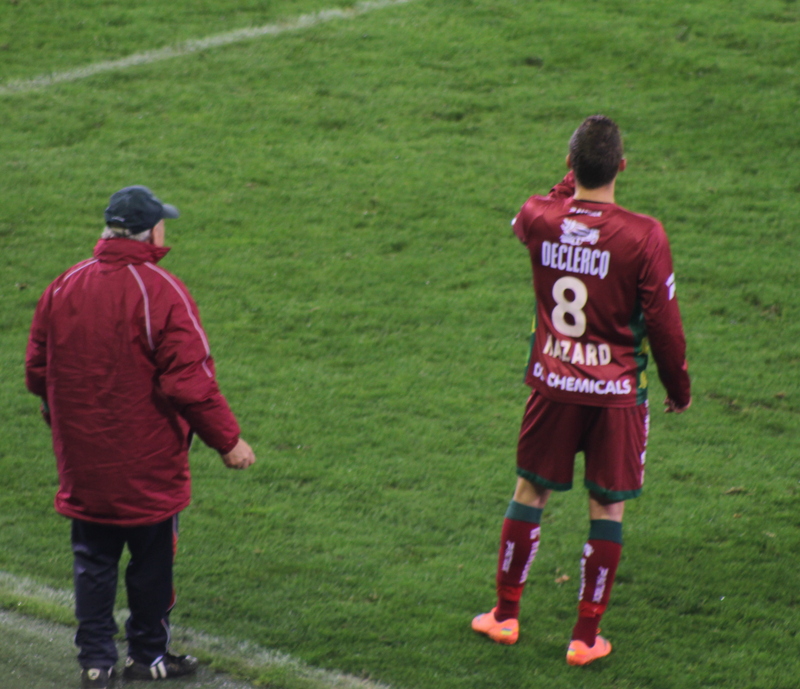 Zulte Waregem’s Thorgan Hazard sharing a joke with Franck Berrier – the man he replaced as no. 10. (copyrightJohn Chapman). Chelsea loanee Thorgan Hazard is favourite to win Belgium’s Golden Boot – awarded to the best player in the calendar year – in a couple of weeks’ time. The question people are divided about is whether he will receive the award as a Zulte Waregem player or as a member of the Anderlecht squad. The bother of the more famous Eden recently left for a training camp with Zulte Waregem in Malaga. However, the stories haven’t stopped about a loan move to Anderlecht and neither has the criticism about the Brussels club potentially poaching an opponent’s best player close to the season-end playoffs. There have also been some questions asked as to why Anderlecht would bring in a young player after they said they were giving their own youngsters a chance. It would be interesting to hear Dennis Praet’s views on the matter. Usually such rumours are either quickly denied or confirmed, with the Belgian media being united in its opinion of the story. Not so with Hazard to Anderlecht as various newspapers either saying it’s a done deal or that Zulte Waregem’s relationship with Chelsea is solid and he won’t be going anywhere in January. A piece in Het Laatste Nieuws today had Zulte Waregem captain Davy De fauw quoted as saying the Zulte Waregem players were laughing at the idea of Hazard moving to Anderlecht. Last week, when asked about a possible move, the player himself said that he left such things to his father and his agent, adding that he just wanted to play football. Hazard’ agent is John Bico, a man no stranger to controversy. The Cameroonian discovered Franck Ribery and found the player a contract with Galatasaray but it didn’t work out and the alleged use of a baseball bat by Bico and his associates did nothing to keep the friendship healthy. Until recently, Bico was the agent of the three elder Hazards – Eden, Thorgan and Kylian. However, in an odd career move, Bico has now taken over as General Manager of Belgian second division club White Star Brussels – also the team of Kylian – where he effectively runs the club. This means Bico can no longer act as a FIFA-registered agent but he’s still advising Thorgan while the paperwork is cleared up. In his first season with Zulte Waregem, Hazard played primarily on the wing but in the current season, everything changed. The catalyst was Bico’s greater involvement at the club. He agreed to let Hazard have another season with Zulte Waregem on condition that his player was given the no. 10 shirt, became the main playmaker from a central midfield position and received the captain’s armband. Surprisingly, all the demands were met and it was not until the news reached the Essevee’s dressing room that there was any kind of revolt. In the event, the players demanded that popular captain Davy De fauw remain in place. Hazard agreed – Bico’s decree was overruled – and the young playmaker seemed to grow in maturity in the way he handled the situation. The switch to no. 10 for Thorgan Hazard was extremely successful. He now has nine goals and 10 assists in 21 matches for Zulte Waregem this season – a team in 4th place in Jupiler Pro League despite their miniscule budget. That’s why in a fairly lacklustre calendar year in Belgium, Hazard junior is favourite for the Golden Boot that will be awarded on January 22. 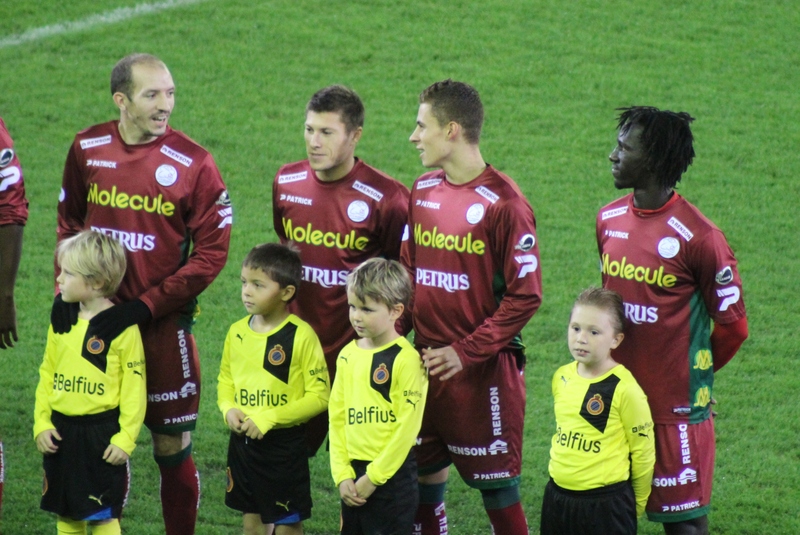 Until recently it was thought that Hazard would help Zulte Waregem in the playoffs with the hope being that, despite Junior Malanda heading off to Wolfsburg, they would be in with a chance of a further European qualification. At the end of the season, he would then head off on another loan period; with a sub-top team in the Premier League, a club such as Aston Villa, being a distinct possibility. The potential move to Anderlecht looks like another tactic by Bico to get one of his players more into the limelight and a move to Anderlecht would certainly do that. He’d be on a reasonable finder’s fee from Anderlecht and it would be his last throw of the dice for his connections with the Hazard family. Doubtless Anderlecht see it as a way of improving their title chances and cementing direct entry into the Champions League, together with the 15 million euros that would bring, regardless of success or failure on the pitches of Europe. As for young Thorgan Hazard, just 20 and already a father, he just wants to play football. Please sir, get your facts right : the alleged use of a baseball bat was dismissed by the prosecutor himself, he called it, FICTIVE. As for the transfert in Galatasary, how didn’t it work out ? Ribéry was a star player in the club and in the championship. It just happened that Ribéry and his family-in-law are ingrateful individuals : Ribéry was lost for professional football when John Bico discovered him. Bico completely changed their lives, they now live in luxury well beyond their wildest dreams. Ribéry’s so-called wife didn’t like the life in Turkey, and one day Ribéry told the man who changed his life, he was going to France, with his wife, to visit his family but they never came back and he signed with another agent (from the Luxembourg) for Marseille. And, in doing so, he left an astonished John Bico deal with the club and furious Galatasary’s fans. Do you think it’s an accident if the same guy who discovered Ribéry is now looking after the interests of the Hazard’s brother, including Eden ? He’s a great agent and a great person, otherwise the parents of the Hazard’s brothers wouldn’t let him advise their sons. Bico is not more controversial than, let’s say, Jean-Pierre Bernès who’s been to prison and is currently Didier Deschamps et Laurent Blanc’s agent. He’s also Ribéry’s agent, the same guy Bico’s was struggling with to make him succesful. Please do not say bad things on someone that you dont know.